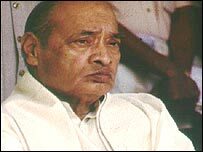 Former Indian Prime Minister PV Narasimha Rao has died aged 83. Mr Rao had a heart attack two weeks ago and died in hospital on Thursday. One of his sons was at his bedside. He was prime minister between 1991 and 1996, leading the Congress party after the assassination of Rajiv Gandhi. He later faced corruption charges. Prime Minister Manmohan Singh, who served as Mr Rao's finance minister, said he would be remembered as the father of India's economic reforms. "It's a personal loss to me," Mr Singh said. Mr Singh, an economist, was brought into politics by Mr Rao to tackle a balance of payments crisis. They are credited with opening up the Indian economy, now one of the world's fastest growing, after years of socialist controls. India is now beginning seven days of official mourning. A state funeral is being arranged. Parliament observed two minutes of silence and then adjourned after the speaker of the lower house announced Mr Rao's death. Tributes have been pouring in for a man who the BBC's Sanjeev Srivastava in Delhi says was one of India's most enigmatic politicians. Former Prime Minister Atal Behari Vajpayee and current opposition leader LK Advani expressed condolences on behalf of the Bharatiya Janata Party (BJP). "How he steered the country's boat through many crises and brought it to the shore shall always be remembered," said Mr Vajpayee, who succeeded Mr Rao in 1996 and built on his reforms. "He was a freedom fighter, a writer and a learned man." President APJ Abdul Kalam said India had "lost a great leader". PV Narasimha Rao was the first Indian leader outside the Nehru-Gandhi dynasty to complete a full five-year term. But his tenure was marred by the destruction of an ancient mosque in the city of Ayodhya by Hindu nationalists in 1992. The demolition of the mosque led to widespread riots between Hindus and Muslims across India in which several thousand people were killed. Bitter religious divisions exist to this day. Mr Rao also has the unwelcome distinction of being the first Indian prime minister to be convicted of corruption. He was found guilty in October 2000 of paying hundreds of thousands of dollars in bribes to a regional party in 1993 to support Congress in a vote of confidence. The conviction was, however, later overturned on appeal. A widower, Rao is survived by three sons and five daughters.